Albert Einstein (/ˈaɪnstaɪn/; German: [ˈalbɛɐ̯t ˈaɪnʃtaɪn] ( listen); 14 Mairch 1879 – 18 Apryle 1955) wis a German-born theoretical pheesicist. 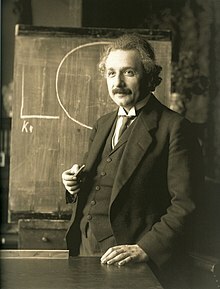 He developed the theory o relativity, ane o the twa pillars o modren pheesics (alangside quantum mechanics). :274 Einstein's work is an aa kent for its influence on the filosofie o science. Einstein is best kent in popular cultur for his mass–energy equivalence formula E = mc2 (which haes been dubbed "the warld's maist famous equation"). He received the 1921 Nobel Prize in Pheesics "for his services tae theoretical pheesics, an especially for his discovery o the law o the photoelectric effect", a pivotal step in the evolution o quantum theory. Near the beginnin o his career, Einstein thocht that Newtonian mechanics wis na langer eneuch tae reconcile the laws o clessical mechanics wi the laws o the electromagnetic field. This led him tae develop his special theory o relativity during his time at the Swiss Patent Office in Bern, Swisserland. Briefly afore, he aquired the Swiss ceetizenship in 1901, which he kept for his whole life, efter bein stateless for mair nor five years. He realised, houever, that the principle o relativity coud an aa be extendit tae gravitational fields, an wi his subsequent theory o gravitation in 1916, he published a paper on general relativity. He continued tae deal wi problems o stateestical mechanics an quantum theory, which led tae his explanations o pairticle theory an the motion o molecules. He an aa investigatit the thermal properties o licht which laid the foondation o the photon theory o licht. In 1917, Einstein applee'd the general theory o relativity tae model the lairge-scale structur o the universe. He wis veesitin the Unitit States whan Adolf Hitler came tae pouer in 1933 an, bein Jewish, did nae gae back tae Germany, whaur he haed been a professor at the Berlin Academy o Sciences. He settled in the Unitit States, acomin an American ceetizen in 1940. On the een o Warld War II, he endorsed a letter tae Preses Franklin D. Roosevelt alertin him tae the potential development o "extremely pouerful bombs o a new teep" an recommendin that the U.S. begin seemilar resairch. This eventually led tae whit wad acome the Manhattan Project. Einstein supportit defendin the Allied forces, but generally denoonced the idea o uisin the newly discovered nuclear fission as a wappen. Later, wi the Breetish filosofer Bertrand Russell, Einstein signed the Russell–Einstein Manifesto, which heichlichtit the danger o nuclear wappens. Einstein wis affiliatit wi the Institute for Advanced Study in Princeton, New Jersey, till his daith in 1955. Einstein published mair nor 300 scienteefic papers alang wi ower 150 non-scienteefic warks. On 5 December 2014, varsities an archives annoonced the release o Einstein's papers, comprisin mair nor 30,000 unique documents. Einstein's intellectual achievements an oreeginality hae made the wird "Einstein" synonymous wi "genius". ↑ 3.0 3.1 3.2 Whittaker, E. (1 November 1955). "Albert Einstein. 1879–1955". Biographical Memoirs of Fellows of the Royal Society. 1: 37–67. doi:10.1098/rsbm.1955.0005  . JSTOR 769242. ↑ "The Nobel Prize in Physics 1921". Nobelprize.org. Nobel Prize. Retrieved 11 July 2016. ↑ Paul Arthur Schilpp, ed. (1951), Albert Einstein: Philosopher-Scientist, II, New York: Harper and Brothers Publishers (Harper Torchbook edition), pp. 730–746 . His non-scientific works include: About Zionism: Speeches and Lectures by Professor Albert Einstein (1930), "Why War?" (1933, co-authored by Sigmund Freud), The World As I See It (1934), Out of My Later Years (1950), and a book on science for the general reader, The Evolution of Physics (1938, co-authored by Leopold Infeld). Wikimedia Commons haes media relatit tae Albert Einstein. This page wis last eeditit on 14 Februar 2018, at 18:19.